8 Should This Be On Your Wrist? We've now seen the entire first generation of Android Wear watches, many of which have their own angle—a reason for being, if you will. The Sony SmartWatch 3 is great for outdoors, the Moto 360 is pretty and round, the G Watch R is rounder, and the original G Watch is cheap (sometimes). 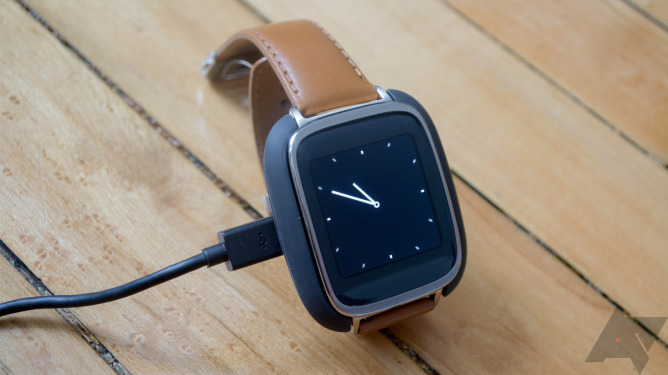 The Asus ZenWatch is the last device to hit the market, but just like the others, it now has the Android Wear 5.0.1 update. I decided to wait until the update was pushed out before posting this review because this will be the first chance we've had to dive deep with a Lollipop watch. More Wear devices will come out in a few months, but what about the ZenWatch? Does being late to the party hurt its chances or did they save the best for last? 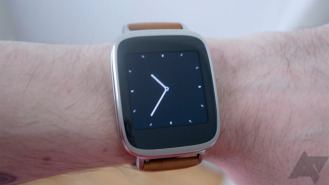 The Asus ZenWatch is a square watch, though I think "squircle" might be a more accurate description of the shape. It doesn't have the angular corners of the G Watch, nor the big rubbery band surround of the SmartWatch 3. The main body of the ZenWatch is a square with drastically rounded corners. A metal rim frames the screen and black bezel. The screen itself is a 1.63-inch AMOLED (more on that later), but the bezel is rather beefy. My first impression of the ZenWatch before I got my hands on it was not great. The bezels just looked gigantic, but it's actually not that bad in person. I'm sure Asus would have preferred to minimize the bezel, but there's only so much that can be done. The screen blends in fairly well when it's in ambient mode, making it look like your clock is floating in the middle of a much larger panel. The glass is curved, which makes the whole top of the watch feel cohesive as it blends seamlessly into the metal rim. 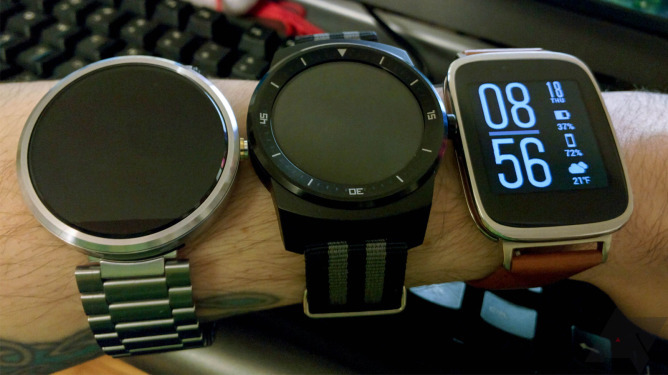 The ZenWatch is a little tall, but it's close to most other Wear devices. The top and bottom of the watch are stainless steel, but sandwiched between them is a copper-colored layer that ties into the band color. I really dig this little pop of color. 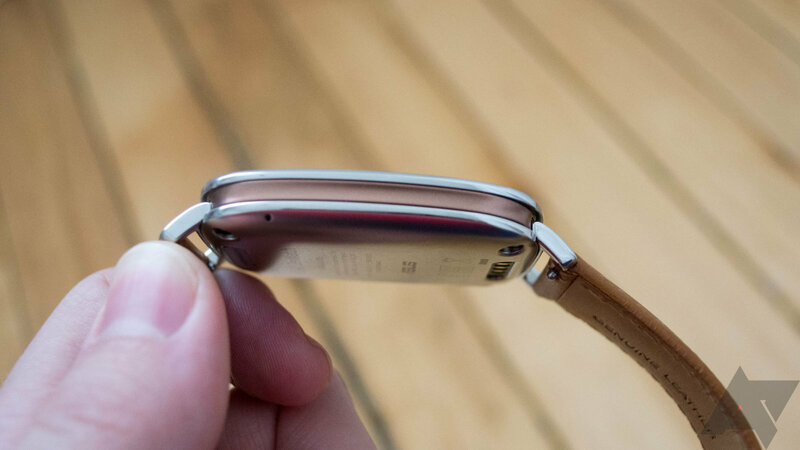 It makes the device feel more stylish while still having an easily replaceable band. There's no button on the side, but the ZenWatch does have one tucked under the right edge. It's not really meant to be accessible while you're wearing it, but does provide a way to turn the device on and off. Wear works just fine without buttons, so I'd say it's fine. Asus chose to go with external lugs to connect the band. They too are stainless steel and rather slender. The stock band is tan leather and uses standard 22mm connections. 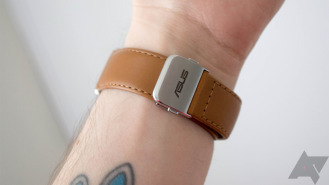 Happily, Asus included a tab on the spring bars, making it super-easy to take the band off (same as the Gear Live). 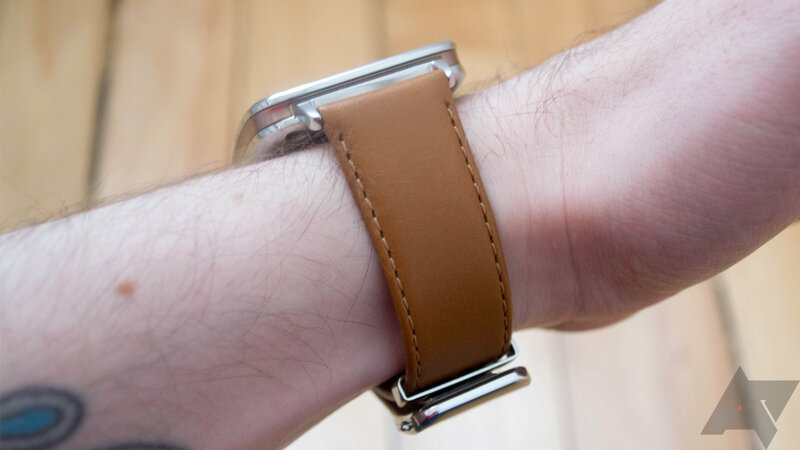 This is yet another genuine leather band, which is a common mid-quality leather you see in watch bands. It feels nice enough, but the real win here is the clasp. None of that boring old buckle nonsense that creases and bends your band. 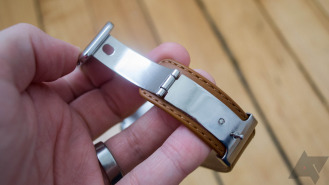 The ZenWatch is equipped with a nice fold over clasp and button release. It looks very clean and professional when closed and it's quick to put on. It's basically the same mechanism as the SmartWatch 3 with the addition of a release button. My only concern is that the closure feels a little wobbly, like it wasn't manufactured to the most exacting standards. It seems sturdy enough right now, but maybe down the road there could be issues. On the back where most Wear devices have a heart rate sensor, you'll only find the pogo pin charging contacts. You slot the ZenWatch into a little plastic cradle to plug it in, which isn't terribly elegant, but it gets the job done. As for the heart rate sensor, it's there, just not where you'd expect. To take your pulse, simply start the Fit app and press two fingers on opposite sides of the metal rim. The downside is that you don't get continuous background reading of heart rate, but the upside is that this actually works. I've never had good luck with the optical monitors in devices like the Moto 360, but the ZenWatch works every time. One notable drawback of the ZenWatch's design is that it's only IP55 rated, whereas most Wear devices are at least IP67 for water and dust resistance. What does that mean? The ZenWatch won't necessarily keep all dust out, but any infiltration that occurs should not interfere with functionality. The water-resistance level is more problematic. You can't submerge the ZenWatch—it is only rated for protection from being under running water (like a faucet). A quick dip probably won't kill it, but it's not as robust as other watches. The overall design of the ZenWatch is nice, and it's really grown on me in the time I've had it. I get it—this is highly subjective. Some people will not be able to cope with the larger bezels, but they can't all be the Moto 360. 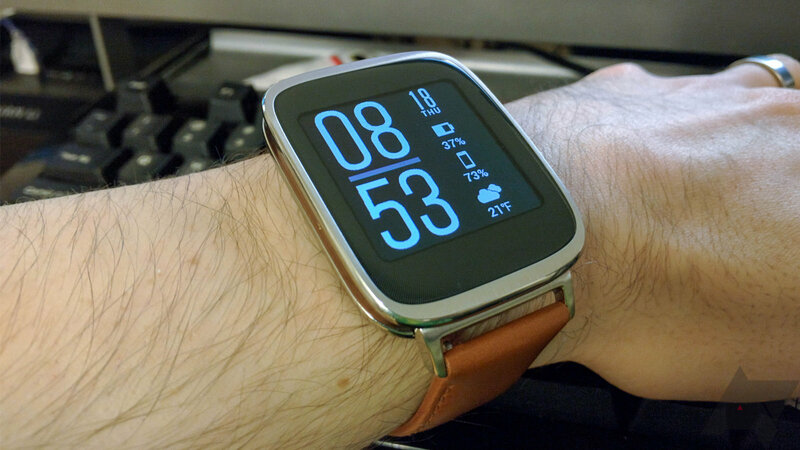 I don't think there's any doubt the ZenWatch is a better looking device than any of the other square watches. It seems to draw a medium amount of attention in the real world. It's just snazzy enough that people wonder what it is. The ZenWatch is also the same basic shape as the Apple Watch (though I personally think it's much more attractive), so several people have led with, "Is that the iWatch thing?" 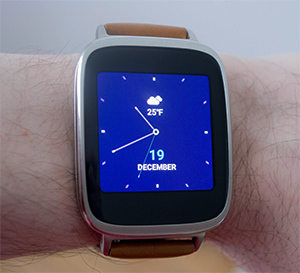 Like the device itself, the ZenWatch's screen is a square with rounded corners. Well, part of the bezel covers the corners to give it a more rounded look. I'm sure the actual panel is square, but that's beside the point. This device packs a 1.63-inch AMOLED screen with a resolution of 320x320. Because we're talking about AMOLED, the black levels are perfect and colors really pop. The display looks great when it's awake, but it's a little weird in ambient mode. Generally, you want as many pixels as possible to be off in ambient mode to save power with an AMOLED panel. When I first used the ZenWatch, I immediately noticed that lines and shading in ambient mode are not smooth at all. Check out the above image. That's indicative of what you'll see on a lot of faces when the watch is asleep. It actually looks like the ZenWatch is downshifting into a lower power screen mode. At first, ambient mode doesn't look bad, then it's like the resolution drops a second later. I suspect it's actually shutting off some of the pixels to save power. It looks kind of PenTile-ish, but I'm pretty sure the actual display is RGB. Some watch faces with fine details that look good on other devices completely lose pieces of the UI in ambient mode because there aren't enough active pixels to resolve them. There's no ambient light sensor on the ZenWatch, but that's still a rarity on Android Wear watches. With the low price point, you have to expect some corners to be cut. That said, the brightness is fine. It gets bright enough to be readable in the great outdoors, but it's not as bright as the G Watch R or Moto 360. This has been a big concern for Android Wear. To be at all useful, a watch needs to at least get through an entire day comfortably. You shouldn't have to worry about the battery running dry while you're out, leaving you with a thing on your wrist that can't even tell the time. I think we're to that modest point on all the current devices, but the ZenWatch is the first watch we've reviewed post-5.0. So how does it perform? It's good. Of course, battery life depends on how you use it, so keep in mind I'm a bit harder on devices than most people. I get plenty of Hangouts messages per day, at least some of which I reply to from the watch. I get a ton of email as well. I usually turn off notifications for secondary accounts when gauging battery life because my use is so outside the norm. Using media controls on the watch and doing voice searches are a big chunk of my use as well. With all that in mind, the ZenWatch seems to get well over a day of life on a single charge of its 360mAh battery (ambient mode on, of course). There has been a modest improvement in battery life after the 5.0 update. I'd say the battery life is a little shy of the G Watch R and both are well behind the Sony SmartWatch 3. The ZenWatch beats all the remaining Wear devices in battery life, though. When the ZenWatch was announced, Asus was making some noise about showing off more customization than other OEMs. Of course, Google keeps the Wear interface pretty locked down, so it wasn't clear what Asus was talking about. Well, it meant bundled apps. You can call it bloat, if you want. It does feel a little bloaty, but not all of it is without use. Asus has included a compass, flashlight, phone finding tool, SOS, Jawbone UP, and a wellness tool that's basically a copy of Fit. There are also a few more features that aren't exposed as dedicated apps that I'll get to shortly. 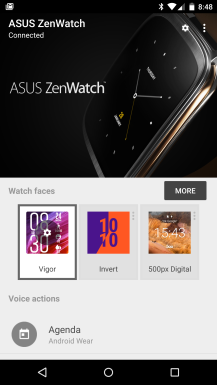 Asus has an app in the Play Store for the ZenWatch, which plugs into several of these apps, and enables a few more interesting features. 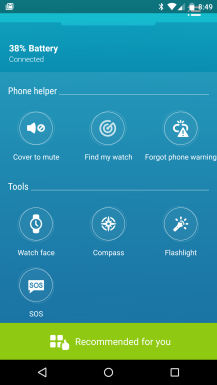 From the ZenWatch Manager you can see the watch's battery level and trigger apps like the compass and flashlight (that's just turning the screen on full blast). 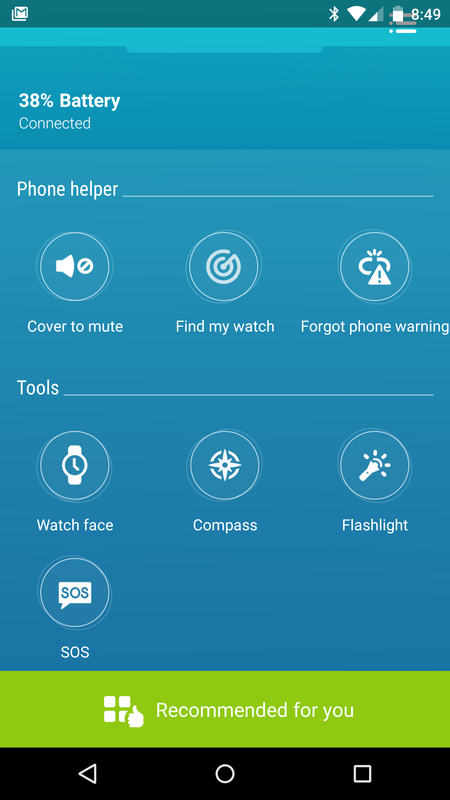 It also has built-in support for a forgotten phone warning and smart unlock on your phone when the watch is connected (if not already supported by your Android version). Basically, the ZenWatch includes a number of features that you'd otherwise get apps from the Play Store to handle. I suppose it's nice to have them bundled with the device for novice users, and it mostly stays out of the way if you want to use Play Store alternatives. You'll have to block the Asus app recommendations, though. As for the stock watch faces, Asus did a pretty good job. 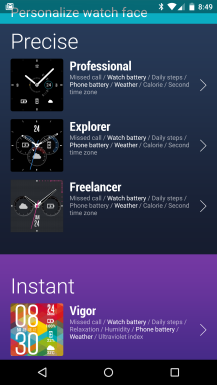 The ZenWatch comes with 10 watch faces in addition to the standard Wear ones (including three that were just added in a ZenWatch Manager update). They run the gamut from great to mediocre, but that's still more than some OEMs have done (looking at you, Sony). Almost all of them are analog, which I find odd for a square watch. The ZenWatch Manager app can be used to customize each watch face, and it plugs into the Android 5.0 Wear app APIs. Most of the faces have additional information like weather or battery level that can be displayed, as well as themes and even custom backgrounds. This is the most built-in watch face customization you'll find, with the possible exception of Motorola. And now we come to Android 5.0.1 for Wear. This is the first chance we've had to get into the minutiae of what Lollipop means for Wear. This update addresses several of my long-standing concerns with the platform. There's finally support for custom watch faces, many of which look great on the ZenWatch. There are some better suited for round displays, but developers seem to be focusing more on digital faces, which make more sense on a square device. I also love how the new Wear companion app lets you choose watch faces on the phone and quickly access the settings for that face. 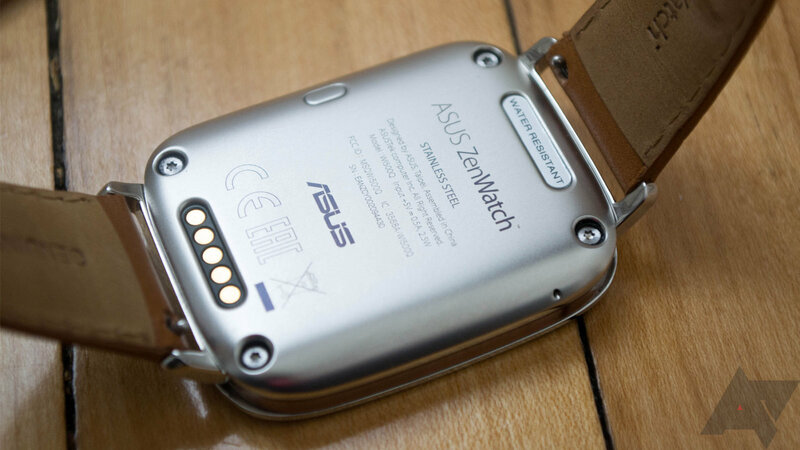 It obviates the usefulness of Asus' ZenWatch manager to a degree, but that's not really the watch's fault. There are modest performance and battery life gains with Lollipop, but the ZenWatch wasn't really bad even before the update. 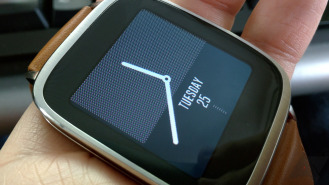 It's based on a Snapdragon 400 and 512MB of RAM like most of the first-generation watches. That's more than enough power for smooth animations and efficient use of sensors. I will say that the 9-axis orientation sensor seems a little more touchy on the ZenWatch than it is with other Wear devices. The more sensitive tilt-to-wake feature in Lollipop makes the ZenWatch wake up more than I'd like when I'm not looking at it. Luckily, the new theater mode is ready to keep the display off when I don't need the watch wasting power. Should This Be On Your Wrist? This is a piece of technology, but it's also going to be on your wrist all day. As such, appearance is more of a concern than it would be for a phone that rides around in your pocket. On this front, I have to give the ZenWatch high marks. I can't convince you that my aesthetic judgements are the best, but I think the ZenWatch is second only to the Moto 360 in design. It's a watch that won't look out of place in a meeting or out with friends. The screen is a sticking point for me. It looks fine most of the time, but the way it displays things in ambient mode really limits the watch faces you can use. I mean, it works well and you can read the time, but a lot of shapes just don't look right—far too jagged and in some cases missing fine details. No watch I've tested yet is perfect, though, and this is just where the ZenWatch falls short. When it comes to software, Asus did a lot of things very right. The phone-based manager app includes a ton of customization options for the 10 included Asus watch faces, some of which are excellent. A few of the bundled features are cool too (remote camera, lost phone, etc.). After you block that recommendation popup on the watch, there's very little hassle from this tiny bit of bloat. I still think the G Watch R is the best Android Wear device, but it's $300. 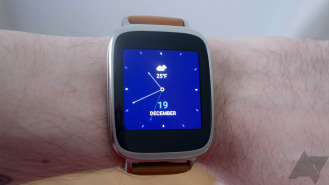 For $100 less, the Asus ZenWatch is a close second. Frankly, it's hard to recommend the GWR over the ZenWatch with that kind of price gap, especially as we get toward the end of this first-generation Wear product cycle. Unless you must have a round screen, the ZenWatch offers the best overall value of any current Android Wear smartwatch.